← Show and Tell; how everybody can make extraordinary presentations. by Lynda Barry. Drawn and Quarterly. 2014. 200 pp. illustrated. Read this book for the engrossing wild-ride – an illustration style – heavily/heavenly laden with cartoons, hand-written text, constantly varying page formatting and border designs, decoupage, watercolour sketches and exciting typographic ideas. Burning houses, drawing ‘jam’ session cartoon images, daily diaries, cartoon stories, pages of wild images from the imagination, short poems by Emily Dickenson, combined with text about deep questions of derivation, meaning, sharing, transforming, daily practice related feelings and much more. I must include an example here to convey some of the lush complexity, excitement and wisdom in this book. 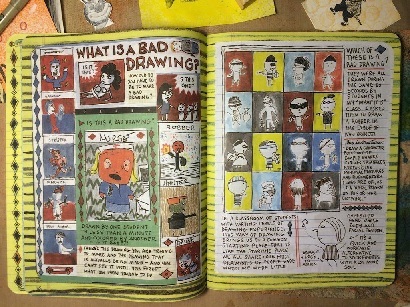 See for yourself, and search/google images for “Lynda Barry Syllabus”. You may feel compelled to just buy the book so you can rave about it with others. This entry was posted in Uncategorized and tagged Aesthetics, Art, Book reviews, Cartooning, Illustrations. Bookmark the permalink.